I love keeping things simple even during the holiday season. As I start decorating, yeah I put my tree up a few weeks ago, but I am not quite finished yet. Anyway, as I start decorating, keeping things simple is really important to me. And with most of my decor, I love the idea of pieces that can be used for more than just one thing. Like the centerpiece I shared yesterday for my table, you can see that HERE. That centerpiece can also be used for a coffee table too! So what about a wreath? 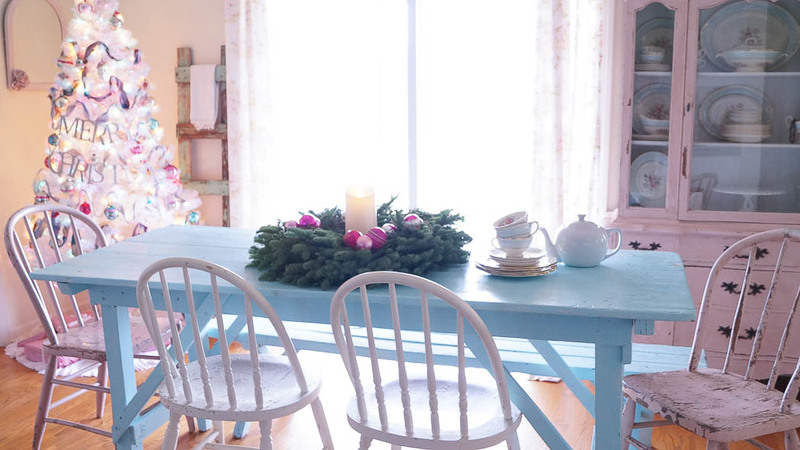 Wreaths don’t necessarily need to be used for hanging. 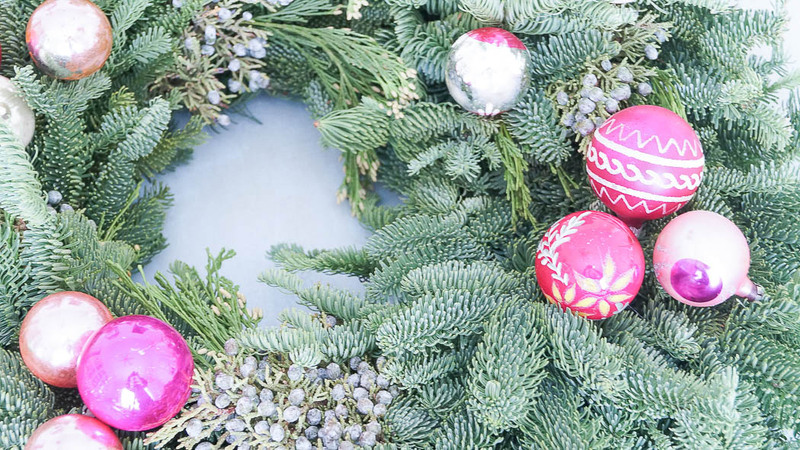 This beautiful wreath is from Lynch Creek Farm. 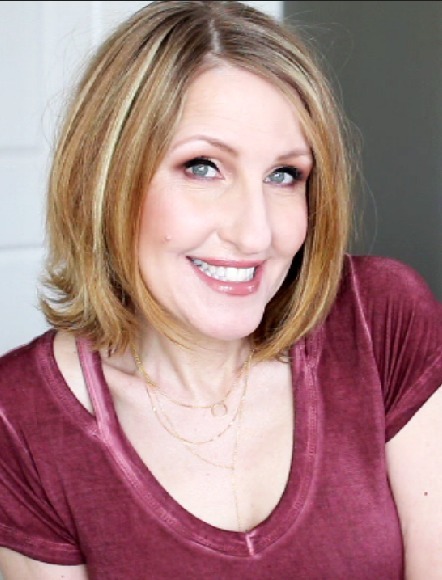 I am thrilled to be teaming up with them once again! Now this wreath really is lovely just as it is. Just add a ribbon and your done. But what about dressing it up a little? I decided to give my fresh wreath a shabby look. So I pulled out a few of my vintage ornaments, and using the wire from ornament hooks, I attached them to my wreath. I added ornaments a little at a time, working in clusters as I worked on my wreath. I didn’t want it to look cluttered, but accent my wreath. If you’re going to hang this with glass ornaments, please make sure that they are fully secure. 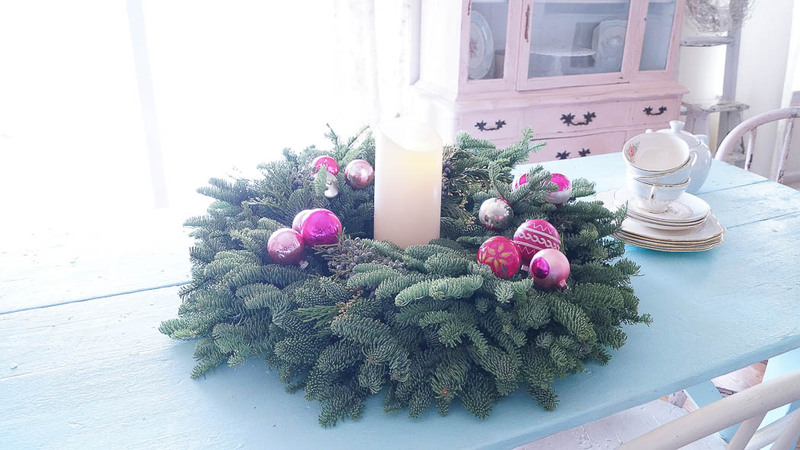 First I wanted to share this beautiful wreath on my table. In the center of my wreath I popped a flameless candle in the center of the wreath. I would never use a real candle, just for safety purposes. Now here’s an idea, what about giving a wreath as a gift. If you wanted to personalized it for someone, besides adding ornaments you could decorate it with something meaningful to the recipient. What about vintage cookie cutters, or you can make your own ornaments and hang them. You can easily make Angel wing ornaments or glitter star ornaments, and hang these from the wreath. Use your imagination, I bet you can think of some ideas. 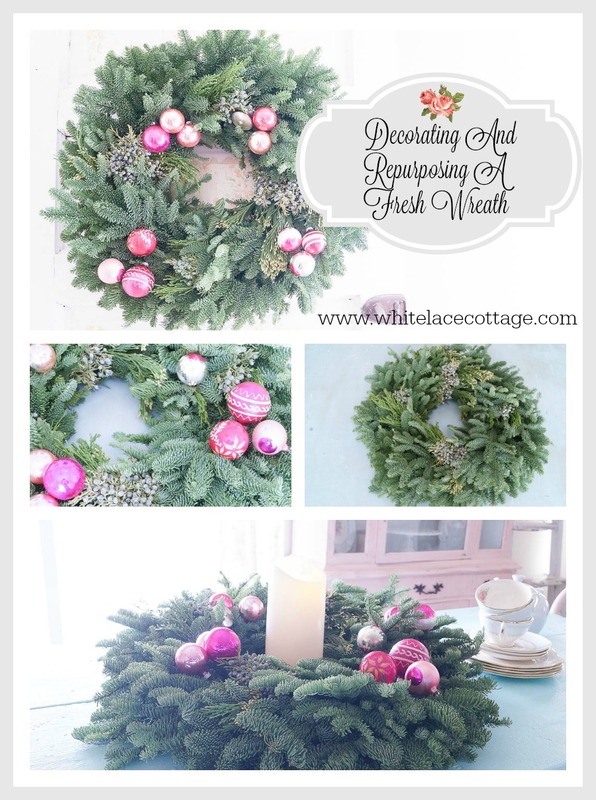 The wonderful think about wreaths is that not only can you hang them, they make beautiful centerpieces. 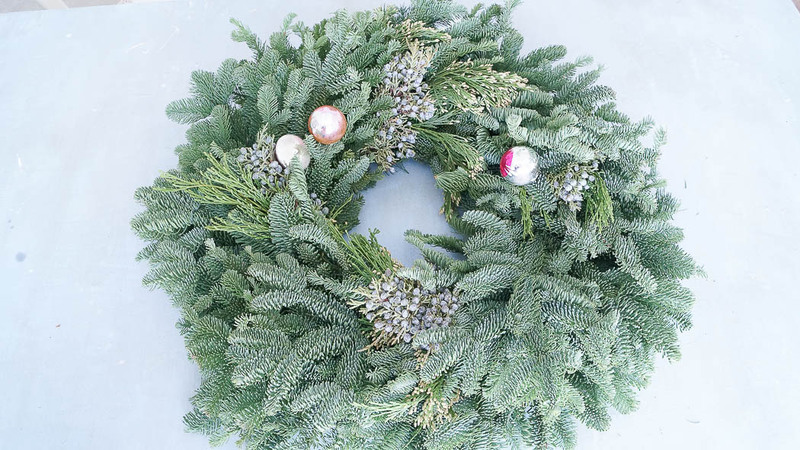 If you keep spritzing your wreath with water, it should last until after Christmas. And here it is hanging on my vintage door in my studio. This wreath from Lynch Creek Farm smells amazing! They have a beautiful selection of wreaths, garlands and centerpieces! Stay tuned because in a few days you will have a chance to win a gift card from Lynch Creek Farm. Yes, I will be picking two winners! So tell me, how would you decorate your wreath and would you hang it or use it as a centerpiece? Don’t forget to enter for a chance to shop Bel Monili! Thank you again for the beautiful ideas for a wreath. I am having Christmas for the family at my home this year. I’m nervous and excited. I hold all and any suggestions from you close to my heart. Thanks again. So-o-o-o-o much. 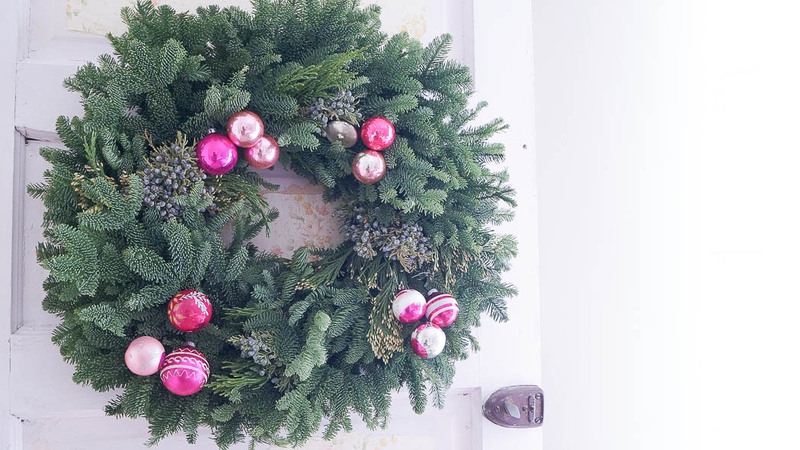 I love the shabby chic wreath you created with your pink ornaments. Sooo pretty. 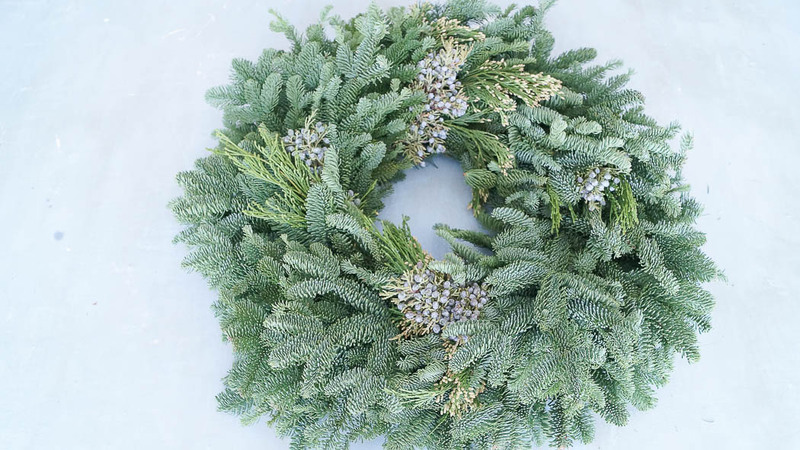 Lynch Creek Farms wreaths are fabulous. This will be a great give away. This is a lovely wreathe and i love the way you decorated it with those pretty pink balls,you always have wonderful ideas. That is some gorgeous wreath. It did make for a lovely centerpiece. Ti is one pretty and very soft wreath. Love it and it I romantic in fee to me.